We’d love your help. Let us know what’s wrong with this preview of Hello, I'm Here! by Helen Frost. Peek in as a sandhill crane hatchling makes its first wobbly stand and takes its first steps alongside its brother. With their parents close by, they flap their wings and dance before enjoying a buggy treat. 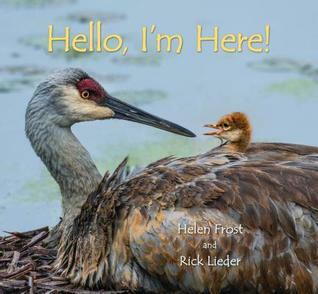 Somed A poetic text and wonderfully intimate photographs follow a newborn sandhill crane as it takes its first steps into the world. To ask other readers questions about Hello, I'm Here!, please sign up. Be the first to ask a question about Hello, I'm Here! Helen Frost has worked with photographer, RickLieder on four other collaborations, including Step Gently Out, Sweep Up the Sun, Among a Thousand Fireflies, and Wake Up! She has other books out as well. Rick Lieder is also a painter and illustrator. This is a team to pay attention to. What a wonderful combination of verse and photo put together to tell a remarkable story about a baby crane’s entrance into the world and life. The full-page photos are clear with crisp details giving a wonderful perspective into the life of a little crane from egg to a young bird not quite ready to fly. At the back of the book is a page with more information regarding the Sandhill Crane Families. It was love at first sight at the cover. How can anyone resist it? Prepare for your heart to melt on the front end pages. Helen Frost's gently lyrical poem from the chick's pov is gorgeously illustrated with absolutely stunning photographs of the eggs, chick, sibling and doting parents on mostly double-page spreads. Perfect. The rhyming text in this book felt a bit more generic than what I typically expect from this author, but the photographs of the baby sandhill crane finding his way in the early hours of his life definitely make up for it. My kids love birds and all baby animals, so I think this will be a hit for them. A beautifully illustrated, easy to understand story about a majestic Sandhill Crane couple and their newborns that just have hatched. The parents teach them the way as their sometimes wobbly legs follow their parents here and there. I loved the story with rhyming verse and the photography with it's many 2-page spreads are gorgeous. Perfect as an Eastern gift or for any occasion. Beautiful, especially pertinent to Nebraska where the cranes rest during migration. Beautiful photographs of Sandhill crane chicks and their parents - would have liked to see them grow up ALL the way (colts, adults). One of the chicks narrates its journey (in verse) into the world and its early life with its family. Competent, but not particularly noteworthy text. A factual summary of the Sandhill crane life cycle follows the main event. I'm dipping my toes into goodreads to see how it works. Thanks for finding me here, and thanks to everyone who has read and written about my books. I love to know you're there, even if I don't come here too often to say so. Helen Frost is the author of six novels-in-poems and two picture books for children and young adults. She lives in Fort Wayne, Indiana. Trivia About Hello, I'm Here!